HPIM4445.JPG, originally uploaded by campdancer2000. Another day, another show under our belts! It has been a pleasure working with Shade and Anastasia for the Mambo Fashion Shows-Runway to the Cure. Next week will be our last show and it will feature Shade and I – maybe someone else too – we’ll see! The audiences have been fun and relaxed – smiling and clapping along at that subdued, “we just ate a lot” pace – but that’s all good! 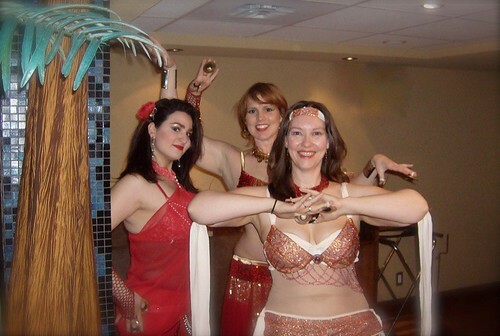 These volunteer events are such a great way to share our love of belly dance with those who may not have seen it up close and personal before. I have a previous post all about my opinion on volunteer dancing so I won’t go on about it again! We were able to sit and chat with Tara, from the Ottawa Cancer Foundation, last night and she was so enthusiastic about how much fun watching us dance was – it is great to hear! And she is also involved in the Weekend to End Breast Cancer – another event that we are going to be participating in – first weekend in June! This weekend brings on three more volunteer events for me – The Bay World Gala events: today at 4 p.m. Bayshore; tomorrow at 1 p.m., St. Laurent and the MS Walk at the Experimental Farm on Sunday morning. I am very proud to be a member of such a strong community of dancers who are willing and able to come out to support these events and share their skills!